The global parking management solution market is progressive with intensifying traffic congestion and need for effective parking systems to address parking concerns across the world. Demand for off-street parking spaces, usually indoor and outdoor parking spaces such as parking lots and garages that are operated by private agencies is expected to support the growth of parking management solution market. Major cities across the world such as Los Angeles, London, San Francisco, Berlin, Shanghai, Hong King, Beijing, and Tokyo are adopting advanced parking management solutions to address traffic congestion and transportation issues. Keen players are focused hard on accentuating their product line and provide integrated solutions for efficiently managing parking requirements. Not only this, development of cost-effective, reliable, and customer-friendly solutions is also the focus of key players in this market. Parking management solution refers to a set of hardware designed and developed to manage and maintain parking availability in high demand areas, especially on-street parking spaces. Single space parking meters and multi-space parking meters are major hardware used in parking management solutions that are integrated with automated payment systems and centralized data management that allows people to find parking spaces in desired locations. A report by Transparency Market Research says the revenue of global parking management solution market stood at US$285.85 bn in 2016. Expanding at a CAGR of 9.3% between 2017 and 2025, the market is poised to rise to US$614.59 bn by 2025. The parking kiosks segment by type is expected to register high growth rate due to its ability for multiple forms of payment, which includes coins, bills, credit cards, smart cards, contactless cards, and tokens. Parking kiosks also have the technology for software upgrades that can be done remotely over a wireless network that eliminate the need to visit each meter every time there is a change in rate. Parking venue segment under installed location is anticipated to display the leading growth rate over the forecast period. Furthermore, the segment of parking venue is anticipated to hold the leading revenue among other installed location segments. The report segments the parking management solution market with respect to the regional segments of North America, Europe, Asia Pacific, the Middle East and Africa, and South America. Among these, North America acquired the leading revenue in the market in 2016. The large number of vehicles in the U.S. displays demand for efficient parking management solutions thereby accounting for high revenue contribution of this regional market. Europe expected to hold significant market share owing to the rising demand for on-street and off-street parking spaces. The EU instructions to minimize environmental pollution are working in favor of the growth of Europe parking management solution market. The parking management solution market is gaining momentum in Latin America and Asia Pacific regions due to the increasing number of municipalities in developing economies such as China, India, Brazil, and South Korea. The increasing concerns of safety of pedestrians, directives for reducing pollution, and need for smooth traffic movement are also key factors behind the growth of parking management solution market in emerging regions. Leading players operating in the global parking management solution market include Parkeon S.A.S, IPS Group Inc., Ventek International, J.J. Mackay Canada Limited, LocoMobi Inc., Cale Access AB, Parking BOXX, METRIC Group Ltd., Worldwide Parking Inc., CivicSmart Inc., and POM Inc. Parking management solution are a set of hardware designed and manufactured to manage parking space in a particular location. It consists of monochrome displays, LED light indicators, solar panel/battery, RFID tags, sensors, automated payment systems and centralized data management system that allow people to find parking in desired locations. The demand for parking management solution market is expected to increase in the coming years owing to rapid increase in automobile usage and increasing adoption for smart city projects across world. Thus, the need for parking management solution is expected to become prominent among government/transportation and private agencies for the smooth running of traffic across streets during the forecast period 2017-2025. This research report provides in-depth analysis of the global parking management solution market for the period of 2015 – 2025, wherein 2016 is the base year and 2017 to 2025 is the forecast period. Data for 2015 has been included as historical information. It also provides the comprehensive analysis of parking management solution market based on type, installed location type and geography. The report also provides an analysis of the factors that drive and restrain the growth of the parking management solution market. 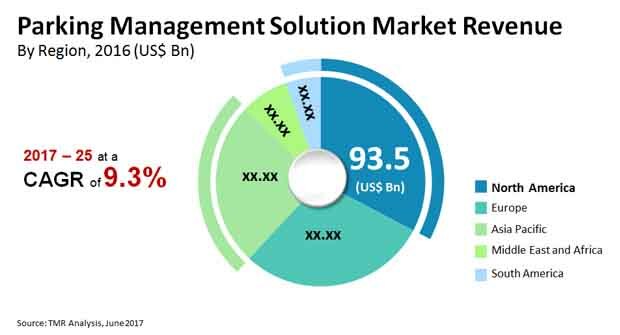 It discusses the prevailing prospective growth opportunities, and major strategies increasing the popularity of the global parking management solution market. The objective of this study is to understand the factors aiding the growth of parking management solution market. The report further aims to identify various factors that are expected to support the expansion of parking management solution market in the emerging markets. The report also provides Porter’s Five Forces Analysis for the global Parking management solution market. It also encompasses the key factors aiding the growth by region in the parking management solution market. It also provides the market estimates and forecasts for all the segments in terms of revenue (in US$ Bn) and volume (Mn Units). The global parking management solution market is categorized based on type into parking meters (single-space parking meter) and parking kiosks (multi-space parking meter) type. Furthermore, the research report provides the complete insights into different parking management solution providers through installed location types which includes on-street parking and parking venues (parking deck, parking complex, etc). The report analyzes each of these segments for various geographies considered under the scope of the study. Based on the geographical regions, the report segments the global parking management solution market into North America, Europe, Asia Pacific, Middle East & Africa (MEA), and South America, which are analyzed in terms of revenue and volume generation. North America is further segmented into The U.S., Canada and Rest of North America, while Europe is divided into The U.K., Germany, France, Sweden, Norway, Denmark, Finland, Iceland and Rest of Europe. Asia Pacific is subdivided into China, Japan, Australia and Rest of Asia Pacific. Also, MEA is further segmented into The GCC, South Africa and Rest of MEA, while South America is subdivided into Brazil and Rest of South America. The report also covers cross segmentation forecasts of Nordic countries. The report also includes the competitive profiling of major players engaged in providing parking management solutions. Major business strategies adopted by them, their market share, and recent developments have also been identified in the research report. This report also provides market positioning analysis of major players operating in the global parking management solution market. The key market players profiled in this study include parking meter and kiosks providers and OEM’s. The prominent providers offering parking management solution include Parkeon S.A.S., Parking BOXX, IPS Group, Inc., METRIC Group Ltd., Ventek International, Worldwide Parking, Inc., J.J. MacKay Canada Limited, CivicSmart, Inc., LocoMobi Inc., POM Inc., and Cale Access AB (Cale Group AB).